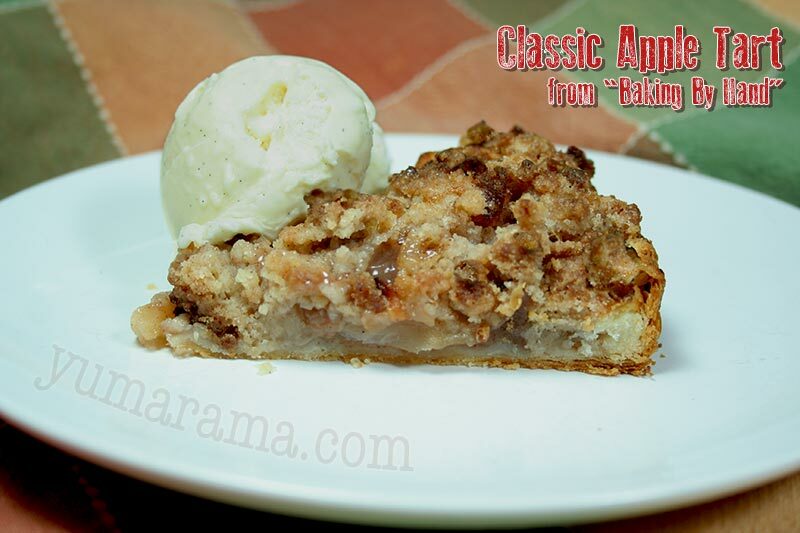 Having received the review copy of the book Baking By Hand, I decided to give their Classic A&J Apple Tart a go, since our apple trees have given us a fair number of apples to use up. This would also let me have a quick look at how well the recipes are explained in the book. I will post a deeper review of the book in a separate entry. The thrust behind the book, as you can likely tell from its title, is to make and bake tasty treats without the use of machines, making these recipes available to everyone, regardless of their KitchenAid mixer ownership status. The Classic Apple Tart uses their “Lazy Baker’s Puff pastry” for the tart shell, a quick puff pastry that can be used for many other tasty applications (the recipe is in the book). The apples they suggest are Cortland; however, I have no idea what types our tree produces. 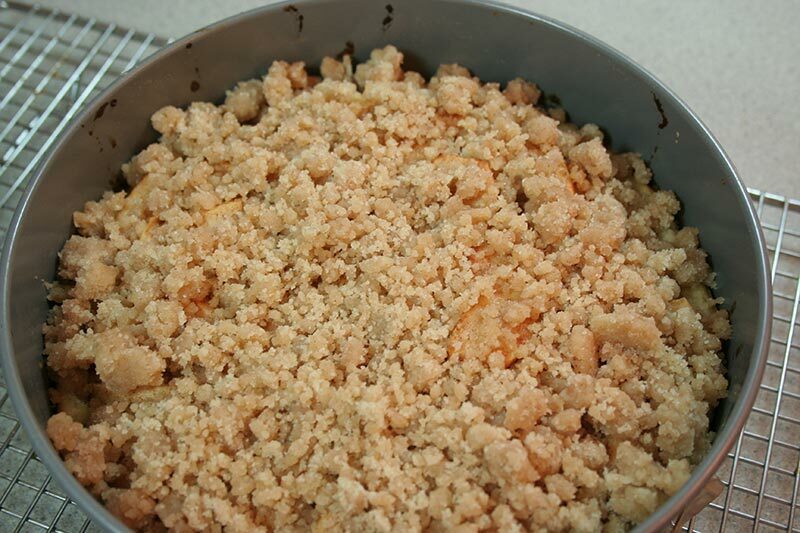 And finally, it gets a crumb topping, something akin to a streusel, to finish it up. The whole thing can be made start to finish in just a couple of hours. 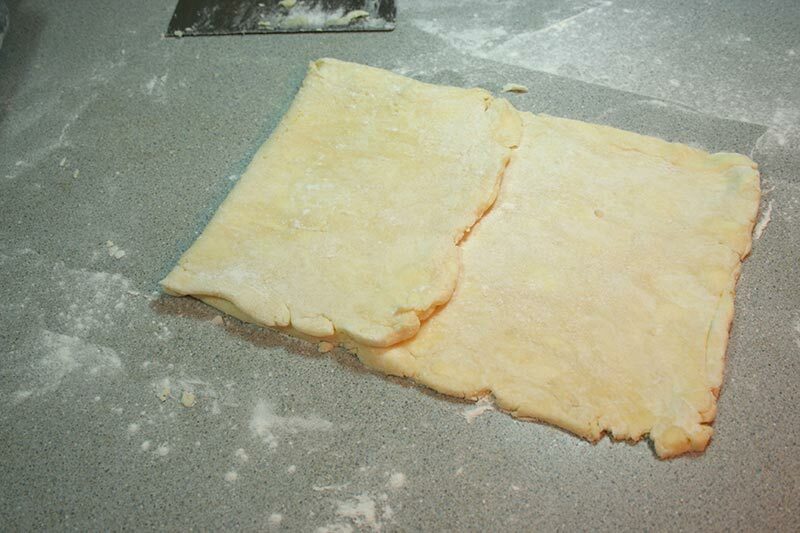 We start by making the puff pastry for the crust. 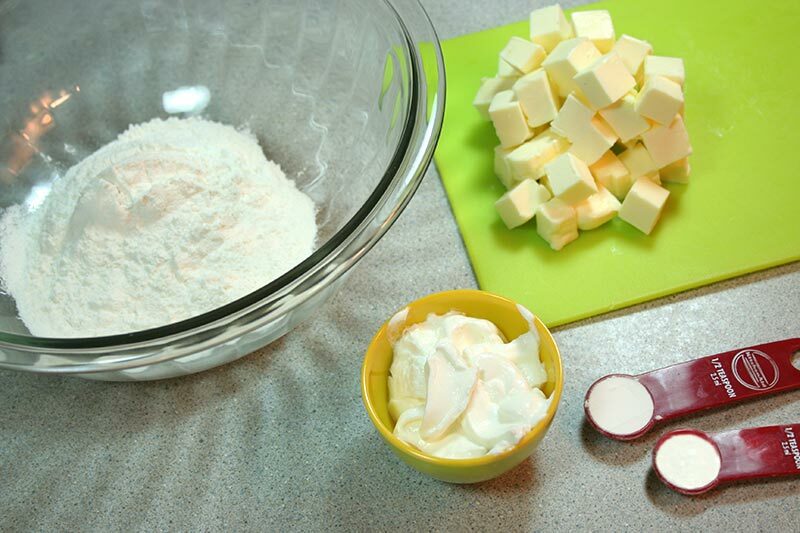 Our ingredients are AP flour, unsalted butter (cubed), sour cream – a little unusual – baking powder and salt. All these ingredients need to be cold, so I popped the flour, salt and baking powder together in a plastic tub and into the freezer for 30 minutes, the butter and sour cream go into the fridge, as does the glass mixing bowl. 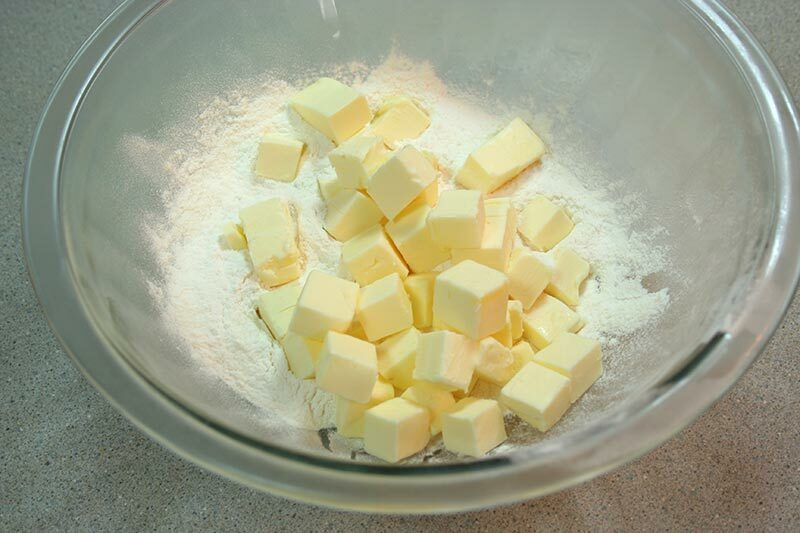 Once everything had been well cooled, I put the flour into the cold bowl and added the cubed butter. 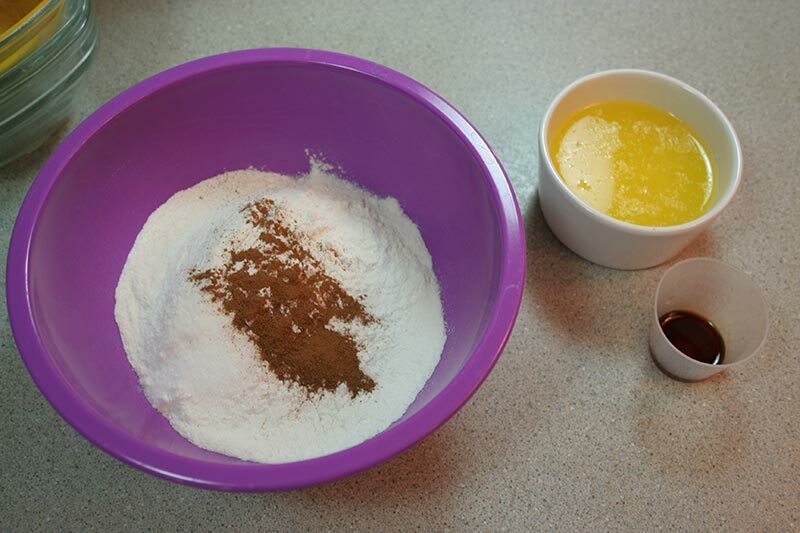 By hand, I mixed and rubbed the cubes and flour until they (generally) were “pea sized”. I suppose I could have used the standard pastry cutter or even a couple of bread knives to do this since these are tools many people have on hand. But I thought it would be better to stick to the instructions and spirit of the book. Pro tip: When making pastry or bread AND trying to photograph the process at the same time, avoid using your dominant hand where possible so the camera doesn’t end up coated in butter and flour. Or hire a helper. 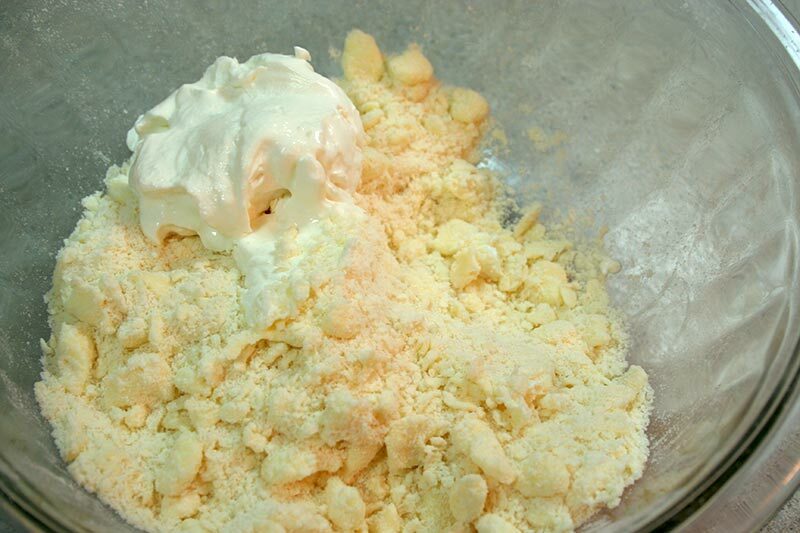 Once properly crumbled, I added the sour cream to the mixture and worked this in by hand as well. 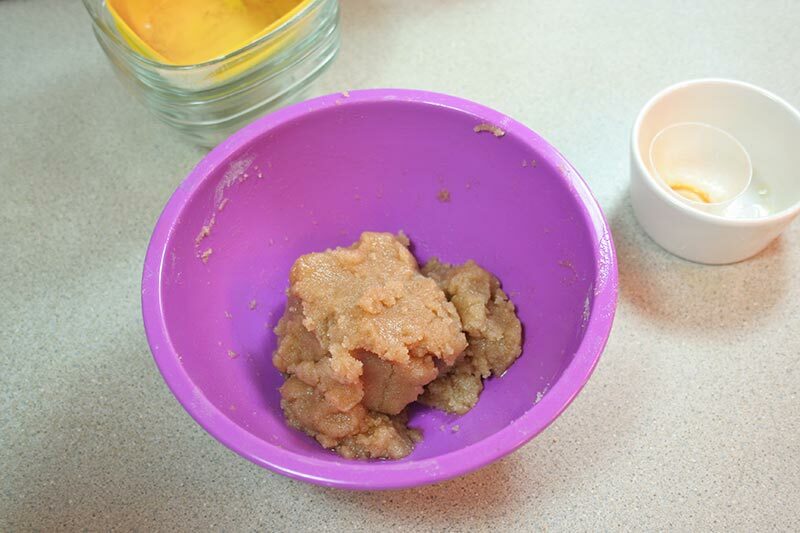 Mix this lightly as you don’t want to have the butter get warmed up by your hand or too well incorporated but you do want to make sure there’s no dry flour left. 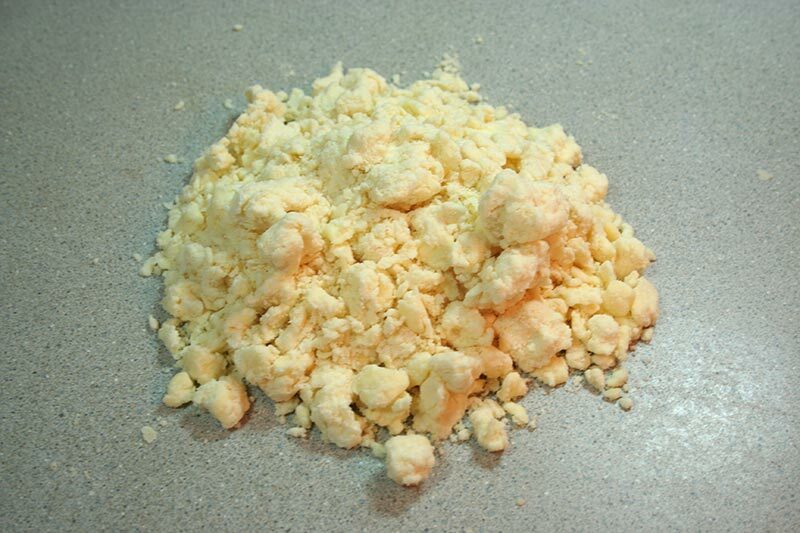 Finally, I turned the crumbly mix out on the counter and gently pressed the mass together into a rectangular shape. 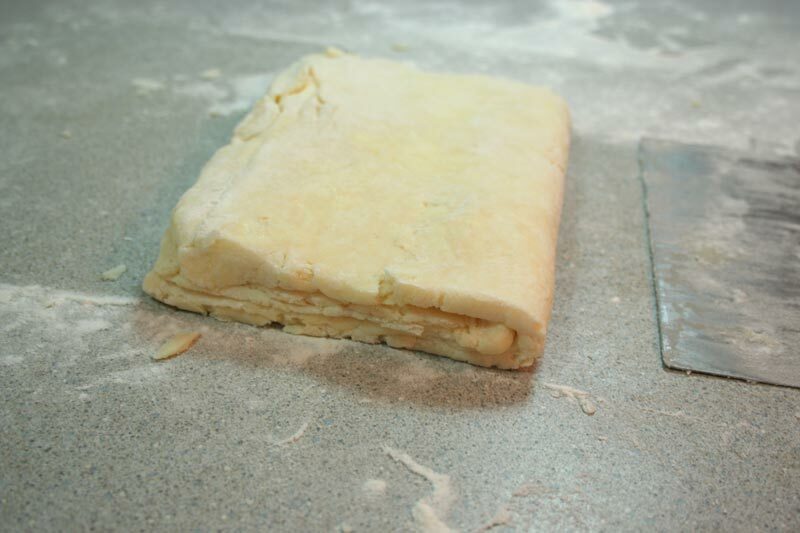 Lifting up the rectangle with the bench scraper, I tossed a light coating of flour on the counter and then rolled the puff dough out into a rectangle 6″ x 16″. 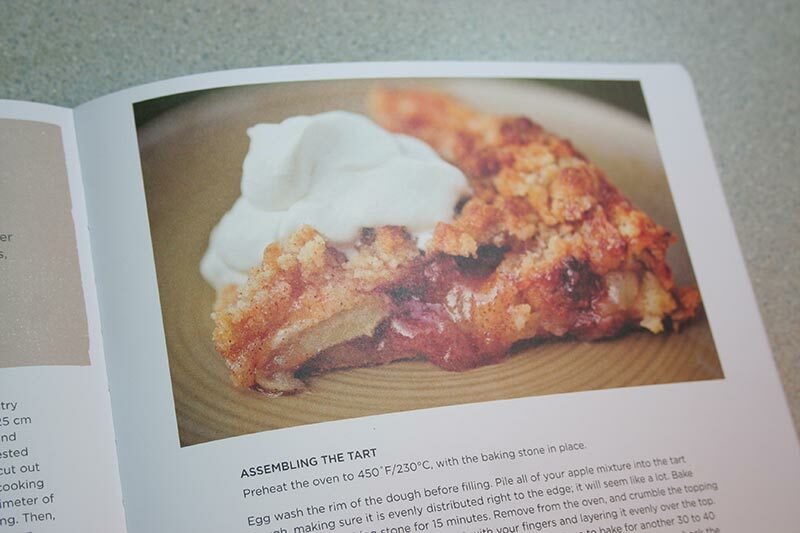 Although after doing that, I noted they wanted 6″ x 10″ since the amount used in this Apple Tart was about half the full Puff recipe on another page. Oh well. Next, I flip the left third over to the centre (with a bit of help from the bench scraper) then flip the right side to the center. I gave the rectangle a 90º rotation then repeated the roll out and folding. 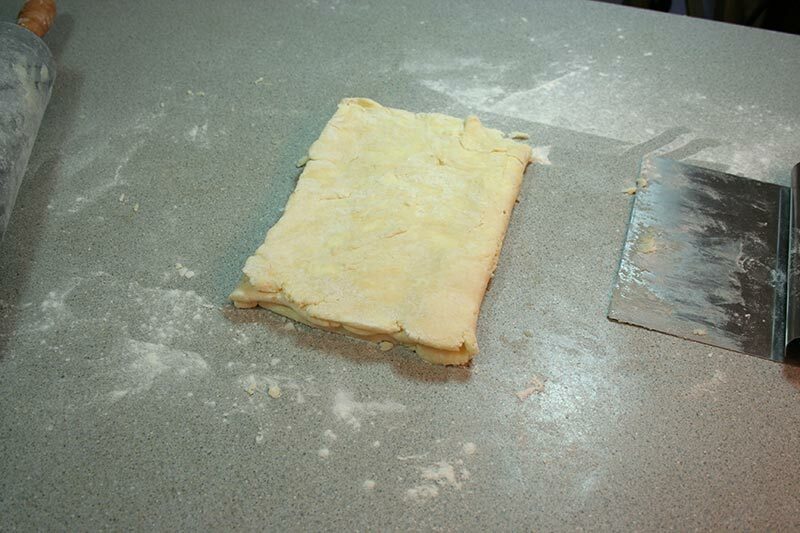 The final dough rectangle is then wrapped in plastic and goes in the fridge for one hour to really chill out, making sure the butter remains cold to give us really nice flakiness. 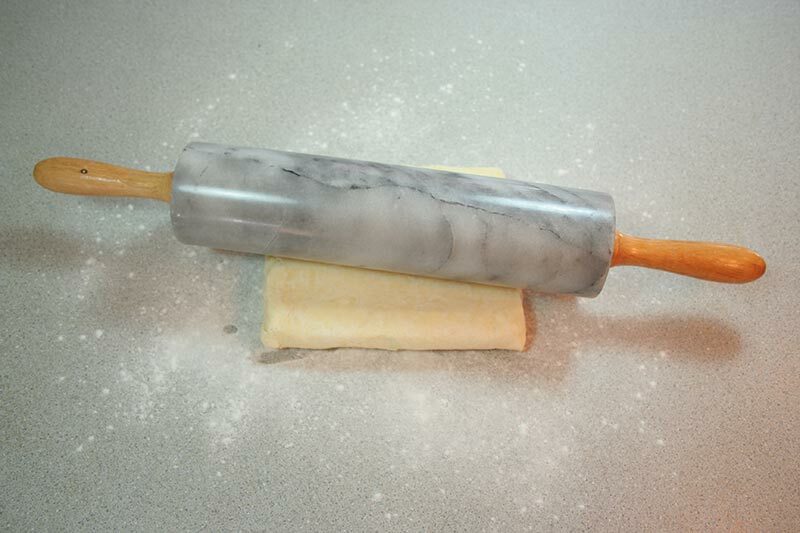 While the dough is chillin’ we can focus on the next steps. 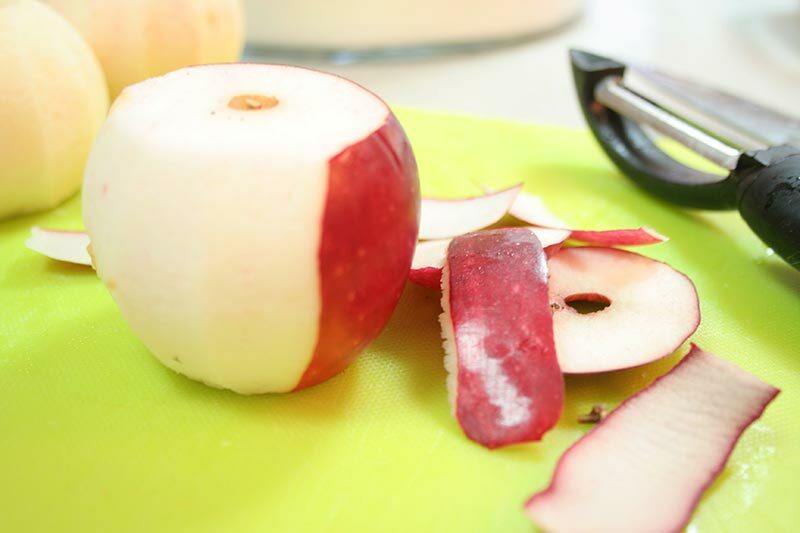 I peel about 6 apples to get the 1 lb of slices required. 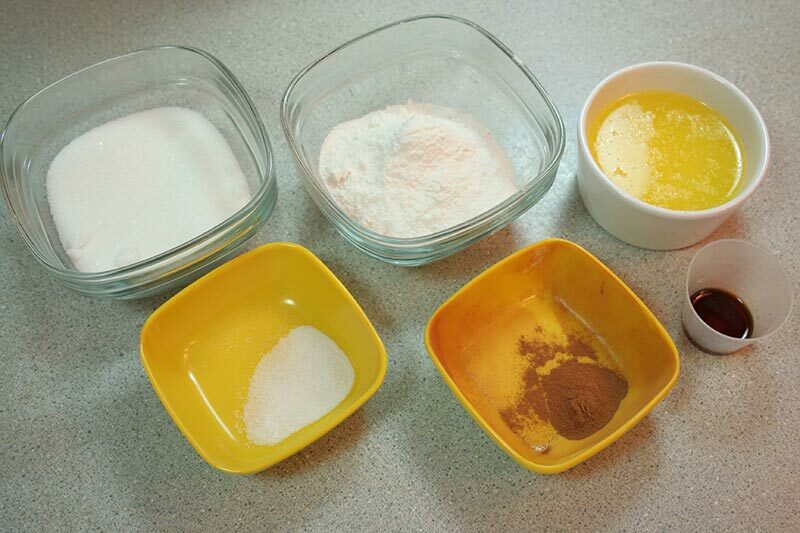 These are now part of the Mise en Place for the filing, which includes cinnamon, All Purpose flour and sugar. They all get mixed and left out to macerate for 30 minutes. 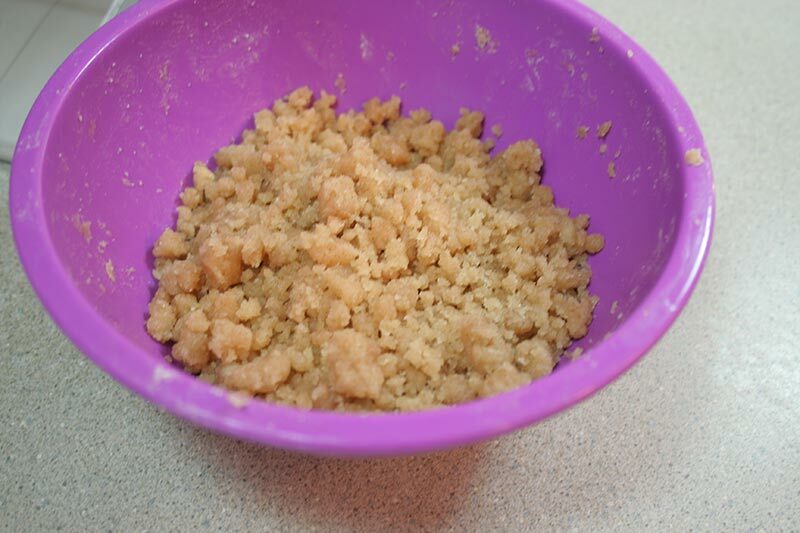 While waiting for these apple slices to make lovely syrup and the dough to finish chilling, we start working on the crumb topping. I pre-heat the oven to 450ºF at this point as well. 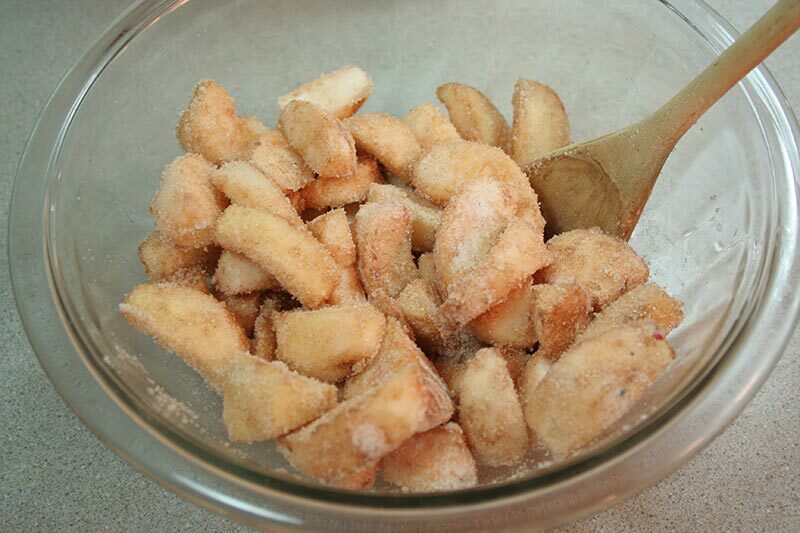 For this part, I need sugar, flour, melted butter, salt, cinnamon and vanilla extract. I mix the dry ingredients a bit with my fingers (oops, now I have cinnamon flour on the camera again) then add the butter and vanilla and mix this up until everything is incorporated. 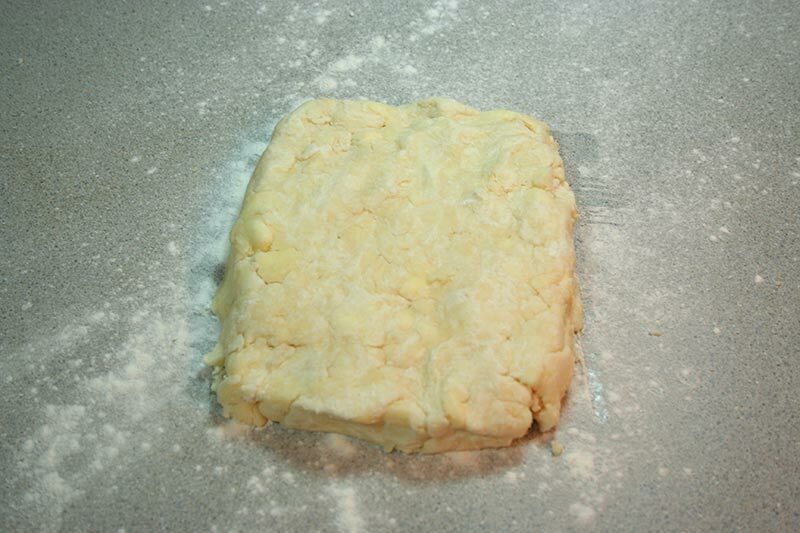 The result is a pasty, clumpy mixture and in a minute or so, the melted butter begins to separate out. Let’s have a chat here for a second. In the ounces measures, both the flour and sugar weigh 3.5 ounces, yet when converted to grams, the flour falls back down to 70 grams while the sugar is at 100 grams, which is pretty much what 3.5 oz should be. (If you hover your cursor over the underlined ounces typed above, it will show you what the actual grams conversion should be, a nifty blog-wide feature here.) Now I know that flour weighs less than sugar so I checked to make sure they hadn’t meant VOLUME ounces, but that didn’t calculate right either. That’s better, nice and crumbly! 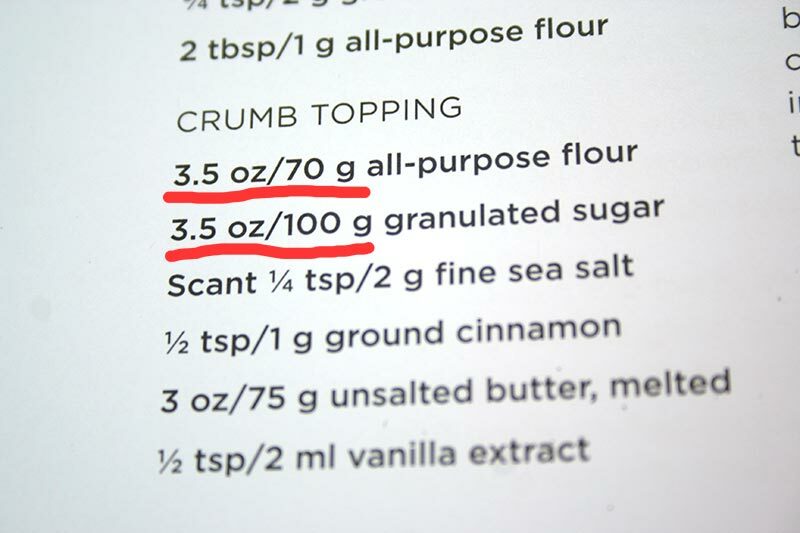 I’ll point out, for those with eagle-eyes, that I had noticed the line ABOVE the flour amounts said the apple slices needed 2 Tbsp of AP flour which they translated to 1 gram. Clearly this too was incorrect although I had already made that adjustment: 2 Tbsp is 1/8 of 127g (1 cup) of flour or about 16 grams. I quickly scan the other measurements for this recipe, knowing one ounce is just a bit under 30 grams (28.35 to be precise); everything else looks alright. These two issues taken care of, let’s carry on. 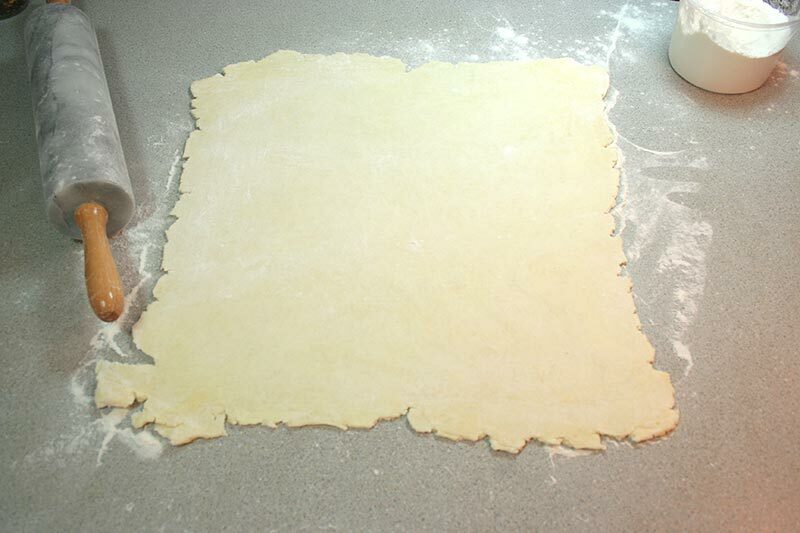 The cold dough comes out of the fridge and I rolled it out to a square about 14″ wide. 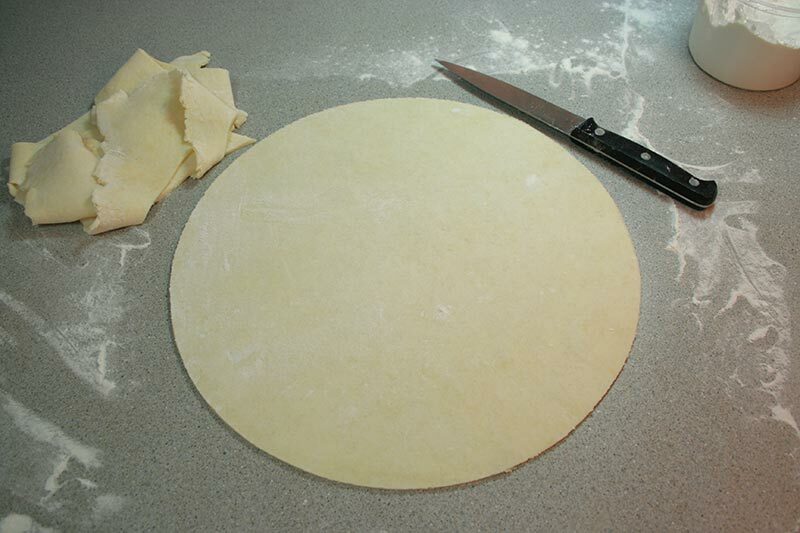 I use a large bowl that happens to measure 12″ as a template to cut out a neat circle of dough. I gather up the excess, lightly bunch it up (to keep the butter bits in bits) and pop that into the fridge for some other use – I happen to have about 220 g, enough for a pie shell. 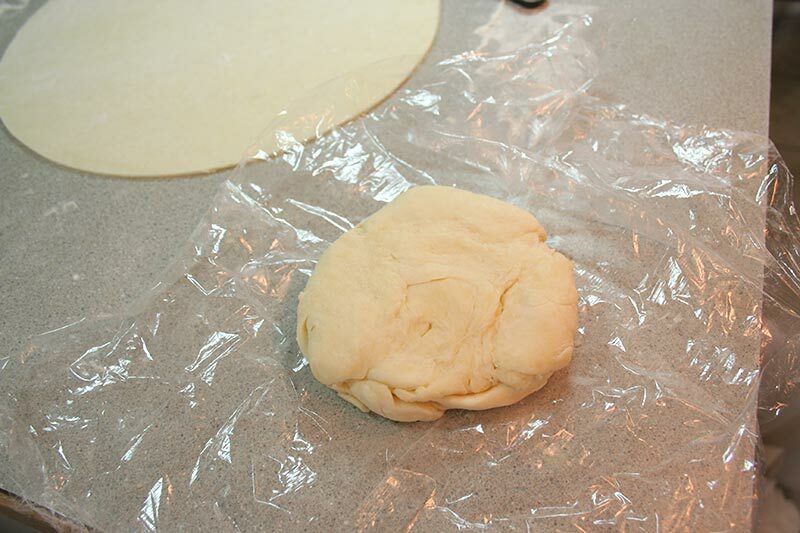 The circle of dough is gently folded in four. 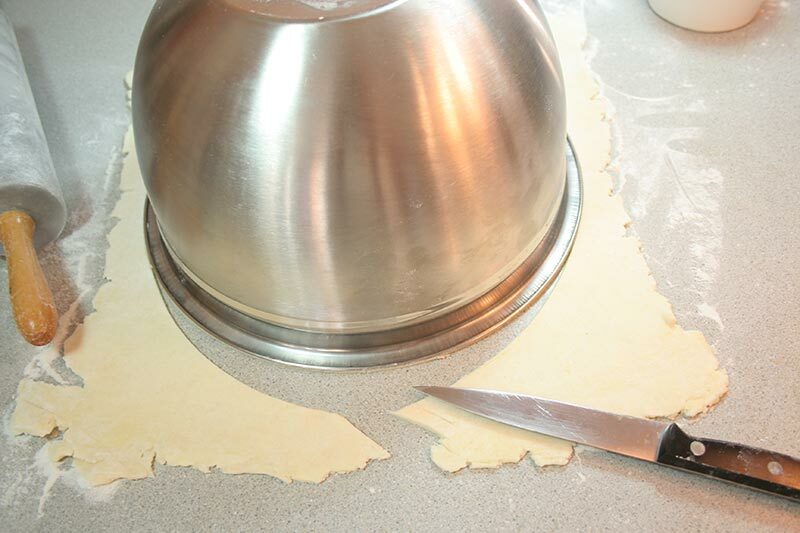 The dough is placed into my 8″ springform pan and unfolded. 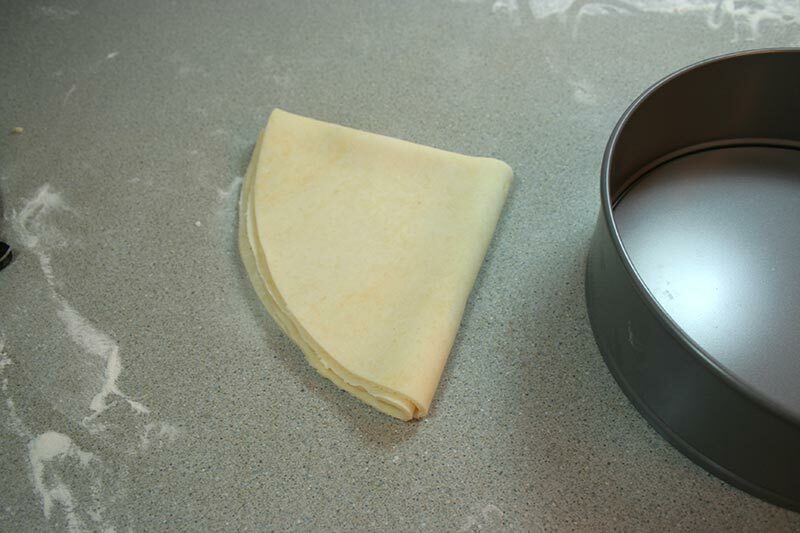 The recipe wants a flan ring but I ain’t got one of them so springform is the next best thing as it will let me remove the outer support once the pie is baked. 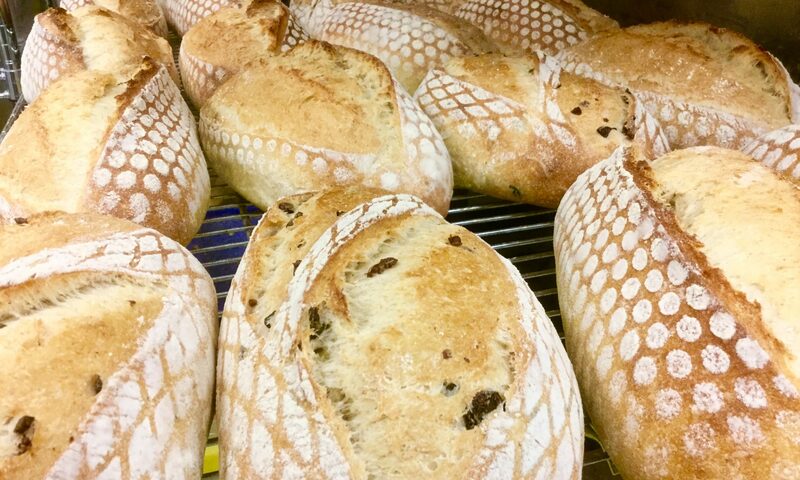 The 12″ round leaves about 2″ of dough up the edges so these get turned down, giving a slightly thicker edge with a thinner bottom crust to the finished tart. The shell is ready, with a turned down edge. This edge then gets a quick egg washing. 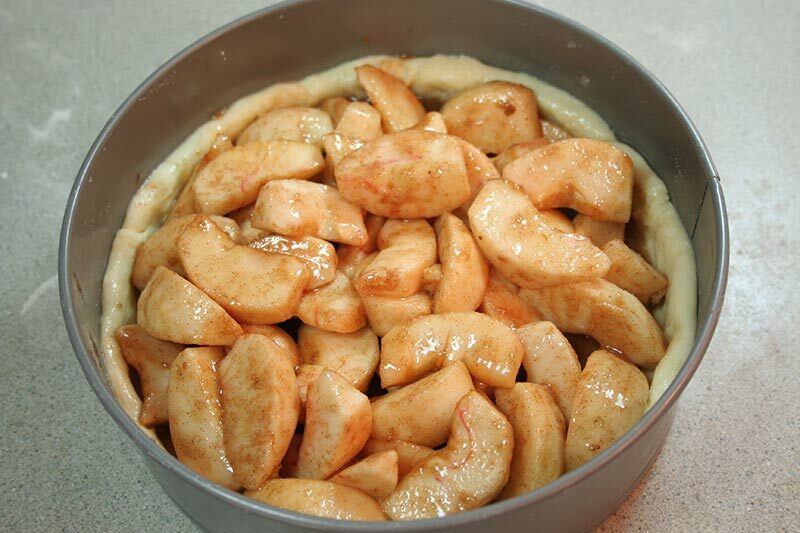 The apple slices, now with a beautiful cinnamon syrup, are piled in and carefully spread out. 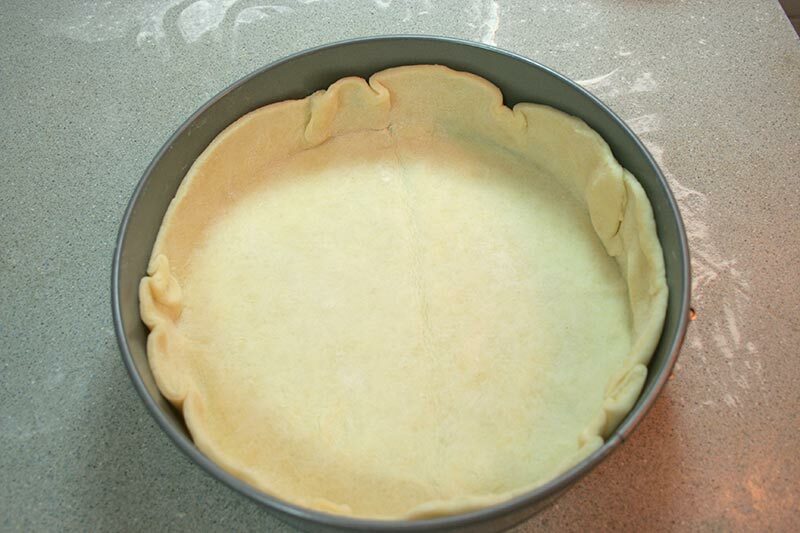 This tart heads into a pre-heated 450ºF oven with a (makeshift) baking stone – in my case, a large porcelain tile. The tart bakes for 15 minutes then comes out to get the crumb topping applied. Back in but on the higher level rack, for another 30 – 40 minutes, according to the book. I set the timer for 25 minutes as I’m not 100% trusting the oven I have. And there we have it, at 25 minutes the top is golden brown (although there are a few very dark peaks – I blame my crappy 1980’s oven). 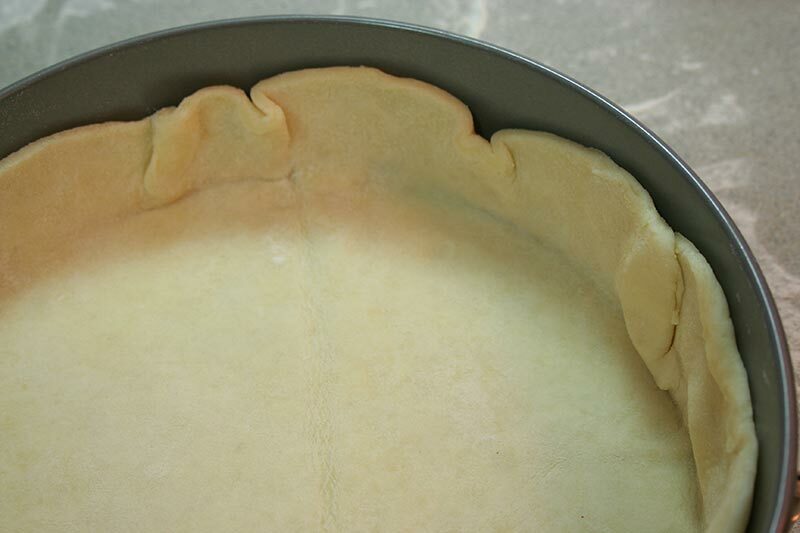 The outer ring comes off immediately and the tart is left to cool. It looks and smells wonderful. When we cut into it for dinner, I’ll get a shot of the slices and add it below. 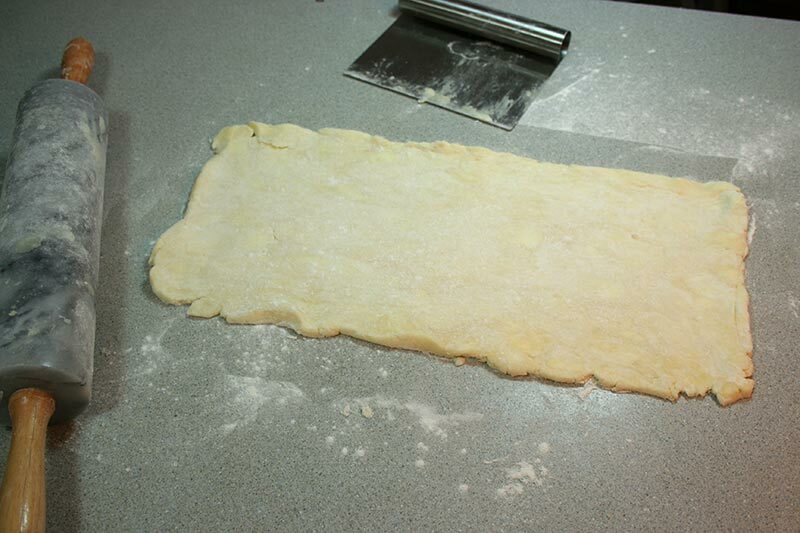 Can’t wait to see what the puff pastry crust looks like. And, of course, taste this tart! Simply: Delicious. 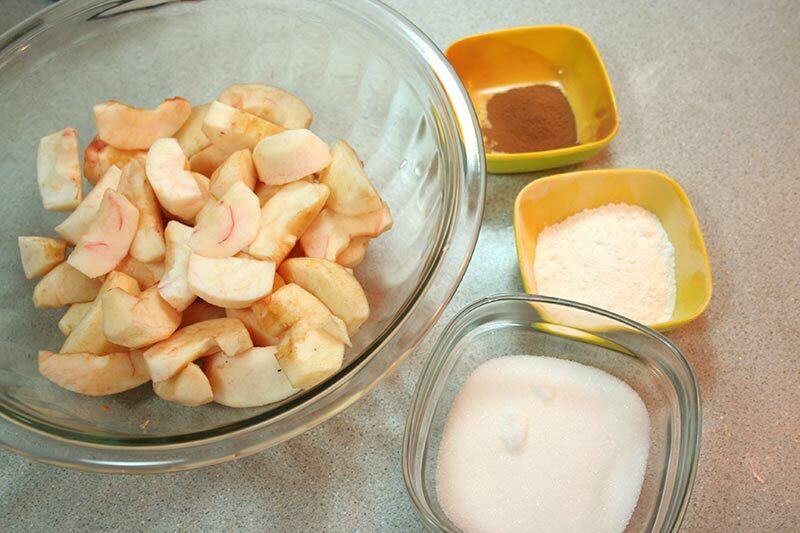 The topping was crunchy, the apples tender without falling apart, nicely seasoned with the cinnamon adding to, not overpowering the apples. 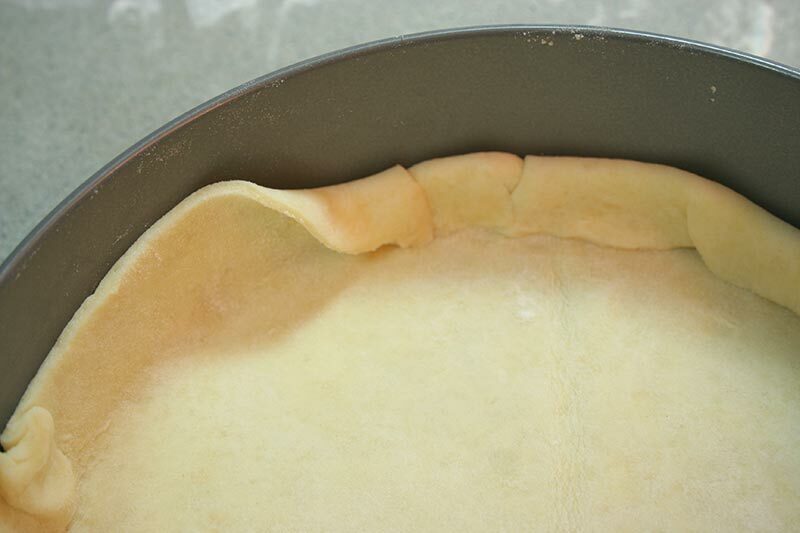 The crust was flaky on the outside edge, had good body on the bottom without turning mushy or toughening up. 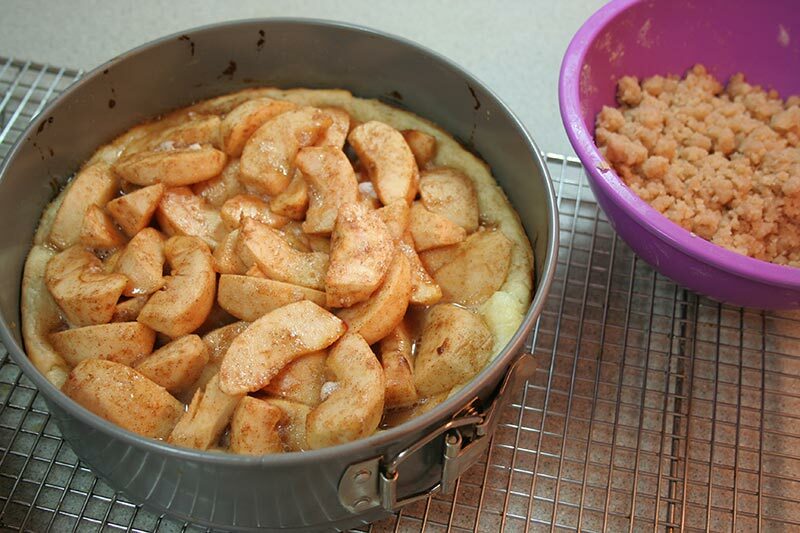 Overall, a really nice apple tart I would be happy to make and serve to guests. 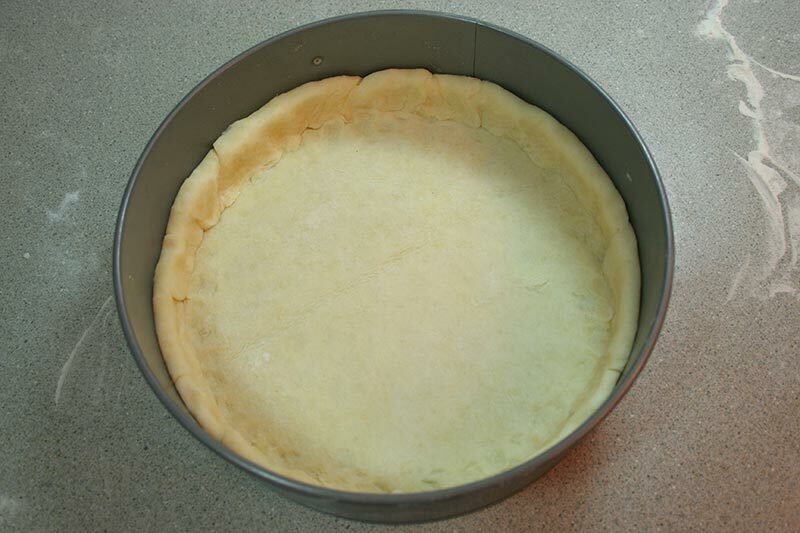 How was putting this tart together based on the instructions from Baking By Hand? I thought the information here was clear, the steps required simply and well explained. The two measurement errors, however, are worrisome. 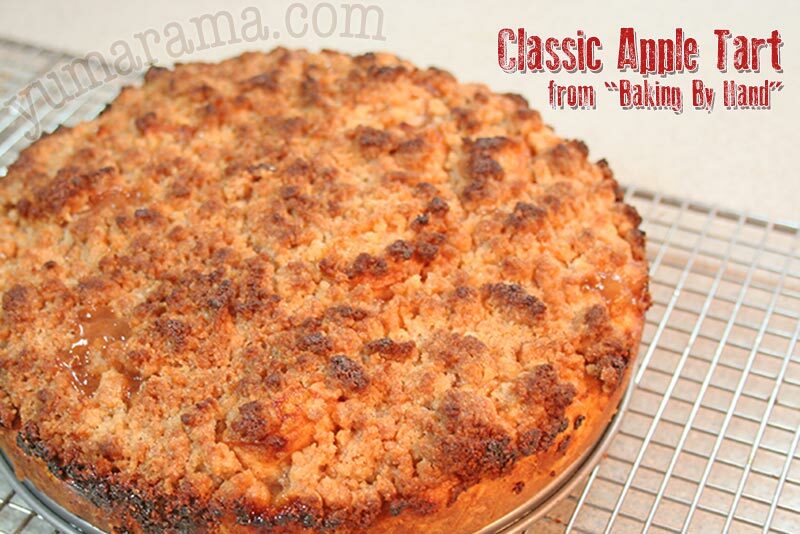 The apple syrup would have been quite runny had I used the 1 gram of flour indicated, and the crumb topping , well, probably runny as well as it was then mostly butter and sugar, great for caramel but not so much for crumb topping. 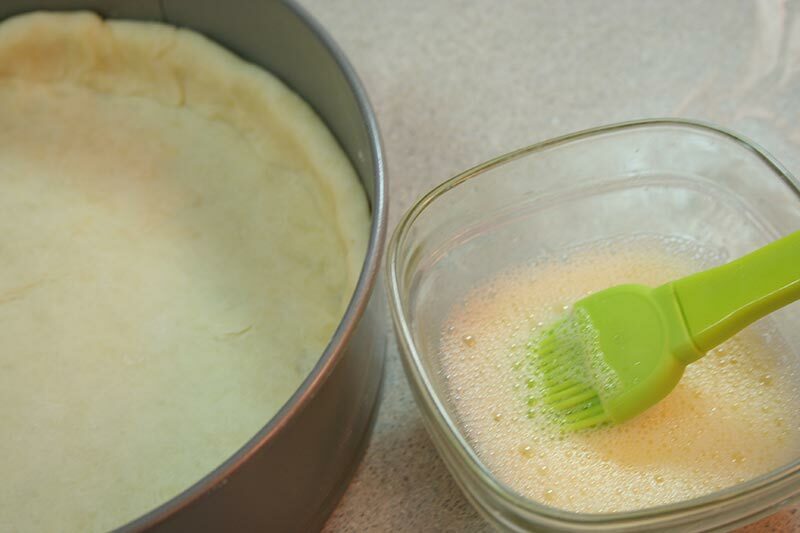 Besides this, I liked baking this and, doing it a couple more times would likely see the process go very smoothly, especially without needing to stop every minute or so to take photos. Doing this whole recipe “by hand” was not an issue at all and in fact a nice change. 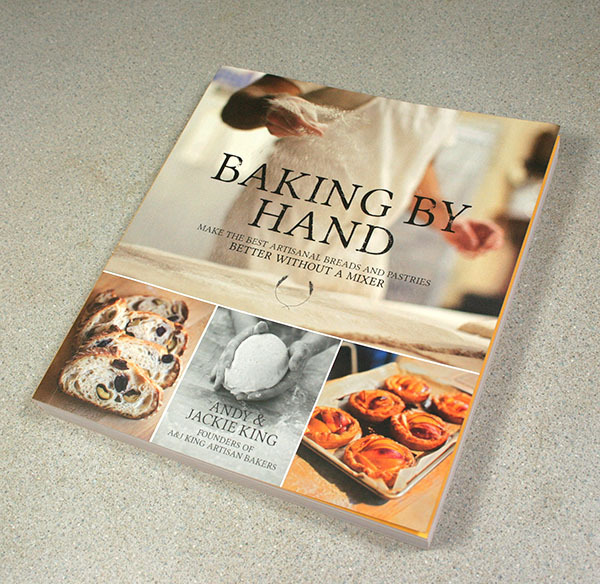 Finally, as I noted, I’ll have a good read through Baking By Hand and give an honest review of it as a whole. Look for that post in the very near future. You can be notified of blog updates via Facebook or use the RSS link on the top right of this page. Previous PostPrevious Baking By Hand Give-Away!